WordPress Image Hover Lite: adds social media buttons to your images, so your visitors can pin each and every one if they prefer. You get 8 social media sharing icons, and a TinyMCE toolbar icon to make the job easier. Easy Social Share: adds social sharing buttons to your website, so your visitors can share your content with their friends. It has various styles and supports 18 social networks. It helps you keep up with social activities originating from your site. Pinterest Master: adds Follow Me on Pinterest, Pin It button, Profile, and other Pinterest features to your website. A great tool to help your visitors keep up with your Pinterest presence. Alpine PhotoTile: displays photos from your account inside your posts or in a sidebar. It offers multiple styles and enables you to create interactive slideshows from your Pinterest posts. 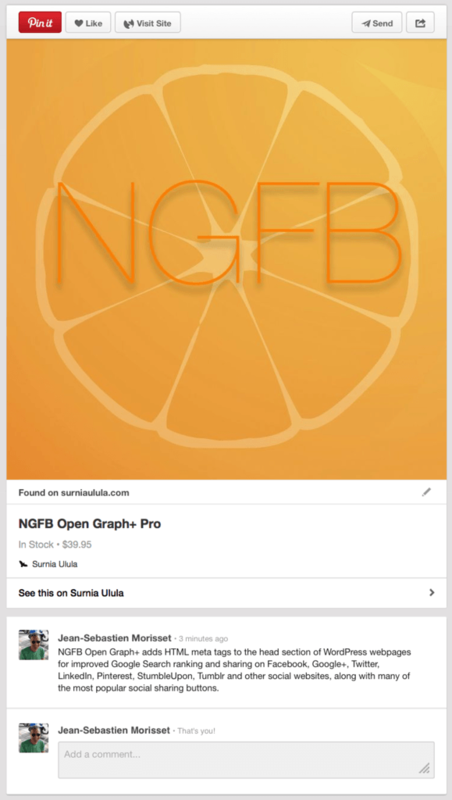 NextGEN Facebook: adds Open Graph / Rich Pin meta tags to your site to increase your site’s social engagement on Facebook, Google+, Pinterest, and other sites. Pinterest Verify Meta Tag: adds the Pinterest verification code to your site’s HEAD section, so people will see a check mark on your Pinterest profile. 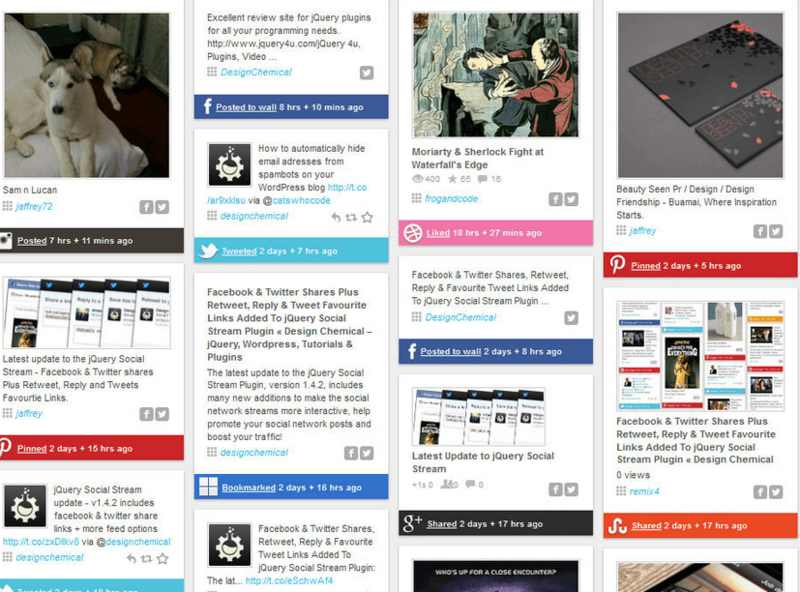 WordPress Social Stream: it lets you add your social media activities to your website. 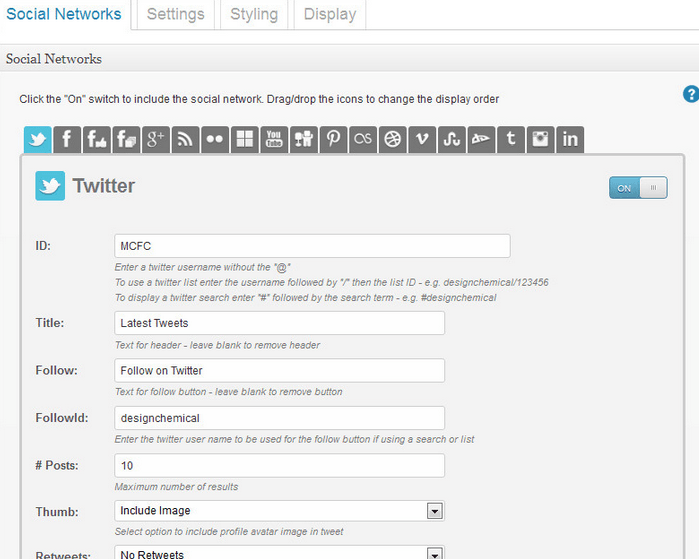 The plugin supports 15 social networks and comes with 60 feed options. It enables you to combine all of your social network interactions into one single network stream. Social Network Tabs: adds social network tabs to your website, allowing your visitors to keep with your social media presences. You can create slide out or static tabs. 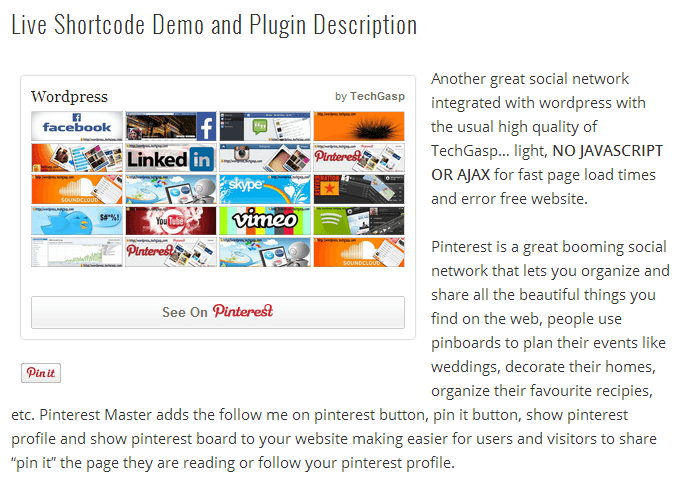 Yet another tool you can use to promote your Pinterest profile. You need a real Pinterest marketing strategy to succeed on that site. The above plugins don’t do all the work for you but make it easier for your audience to stay in touch with your business.